This light is the last of the 400 watt mercury vapor Westinghouse OV-25 fixtures lighting an intersection in Mukilteo, WA. The fixtures are removed as they burn out - this one is still hanging on with its clear lamp. Oh, mercury vapor! I like MV Streetlights very much! 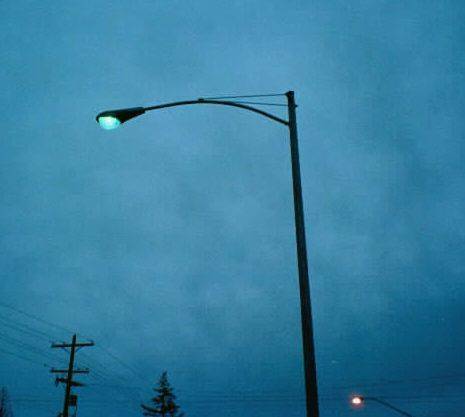 Now the most Streetlights are HPS! There were about 820 mercury vapor fixtures still in service in the City of Pittsburgh until 2005 when the city eliminated them. I still use a 400 watt mercury vapor fixture in my driveway. Figures. Here in LA the mercs on the freeways are gradually disappearing as more series wiring gets replaced by parallel wiring and the merc luminaires get replaced by HPS.